Vince Cable has a frankness about him. Rising to defend the motion that the Anglo-American ‘special relationship’ was over, Cable’s opening remark at the Cambridge Union was met by warm laughter. “The last time I was asked to speak about this subject was over half a century ago, in this very chamber.” In the decades since Cable’s tenure as President of the Cambridge Union in 1965 a lot has changed in Anglo-American relations. The ‘special relationship’ was always “totally and utterly one-sided”, argued Cable, and extended little further than a pragmatic military alliance of two world powers travelling in very different directions. "The evidence suggests that the public mood [on Brexit] is shifting. Not massively, but its shifting"
In the political arena, there were fewer tougher roads Cable could have picked than to become leader of the Liberal Democrats. His party continued its electoral decline under Tim Farron, winning just 7.4% of the popular vote in the 2017 snap election, prompting Farron to step down as party leader. “That’s what I inherited. It was a very difficult position and we had some very bad general elections.” Cable is now one of only 12 Liberal Democrat MPs. In recent months, however, the campaign to have a ‘final say’ on the Brexit deal has given the party a renewed purpose. Having been associated in the past with an uneasy alliance with the Conservatives and a reputation, unfairly perhaps, for ‘fence-sitting’ politics, Cable has landed the party firmly on one side of a rather large and, it seems, insurmountable fence between 'Leavers' and 'Remainers'. But Cable argues that "the public mood is shifting. Not massively, but its shifting.” 700,000 were claimed to have marched at the ‘March for the Future’ in London last month, including Cable himself. This week, CUSU Council also voted to back a ‘People’s Vote’ on the final deal. When I question him after the debate, Cable’s statements on Brexit are measured. His quiet voice keeps the journalists huddled around him like a slow-burning fire; his presence in the small press room is that of a sage rather than a pundit. At 75 years of age, a stoic wisdom coupled with self-deprecating modesty have made him a popular political figure even beyond his party. His reputation casts him into sharp relief with the bombasticism of other politicians. "I think we would get a different result if we had a vote on the final deal"
Through espousing the ‘Brexit as backlash’ narrative, Cable is attempting to form a broad, if unstable, compromise. This way, Brexit can be simultaneously framed as the wrong decision without placing the responsibility for that decision on the people who voted for it. It’s certainly one way to draw support for a second vote from both sides, though I doubt the balance of support is remotely equal. While I’ve yet to meet a Leave voter who regrets their vote, I’ll hold out on Cable’s judgement. I’m not so sure, however, that Cable’s vision of reconciliation through another referendum is shared by even a minority of the voting public. If he’s right that people are angry, he’s also right that to not deliver on their demands as expressed through a democratic exercise will only exacerbate it. Cable has correctly diagnosed that the political system itself is in the dock. Yet, by espousing a second vote, he perhaps underestimates the gravity of the trial. It will be whether the political establishment delivers on Brexit that will be its saving grace, at least for now. What of Cable’s strategy for the party? “There is a whole lot of stuff where we hold broadly sensible positions, which are not on the extremes like with Labour and the Conservatives.” These include plans to regulate the ‘tech-giants’, legalise cannabis, and secure a sustainable plan for the health service. Internal reform is also on the agenda. “What I want to do is reform the party and make it much more liberal and inclusive.” That will include inviting non-members and non-MPs to participate in local and central decision making. As with all current affairs, however, “it depends what happens with Brexit - that's the dominant issue of the day.” The ‘People’s Vote’ may be a political gamble, but it’s one he’s willing to take. 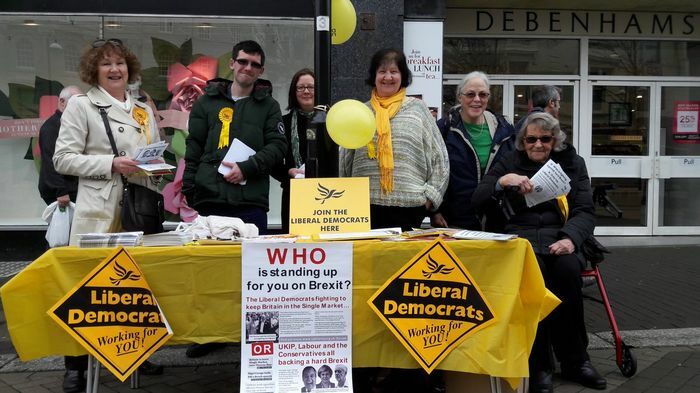 “One of the positives is that we’re staging a recovery at the local level - we had a very good round of council election results in May, a lot of local elections going in our favour, and membership is very buoyant.” And so Cable’s Liberal Democrats have made their wager. Vince Cable is a leader with limited support and a mountain to climb, but unlike some of his more established adversaries, at least he knows it.